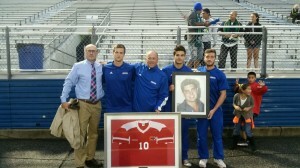 We salute the NY Cosmos for honoring Sergio on Heroes Night during a pre-game ceremony on Sept 13, 2014. Sergio’s sister Maricel was presented with a #10 NY Cosmos jersey and Executive Director Joe Brosi was presented with an honorary #10 FDNY jersey as well. Members of the Hofstra Men’s soccer team including scholarship recipient Maid Memic and Head Coach Rich Nuttall were in attendance as well. 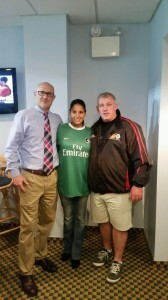 The NY Cosmos host Heroes Night on Sept 14th at 7pm. 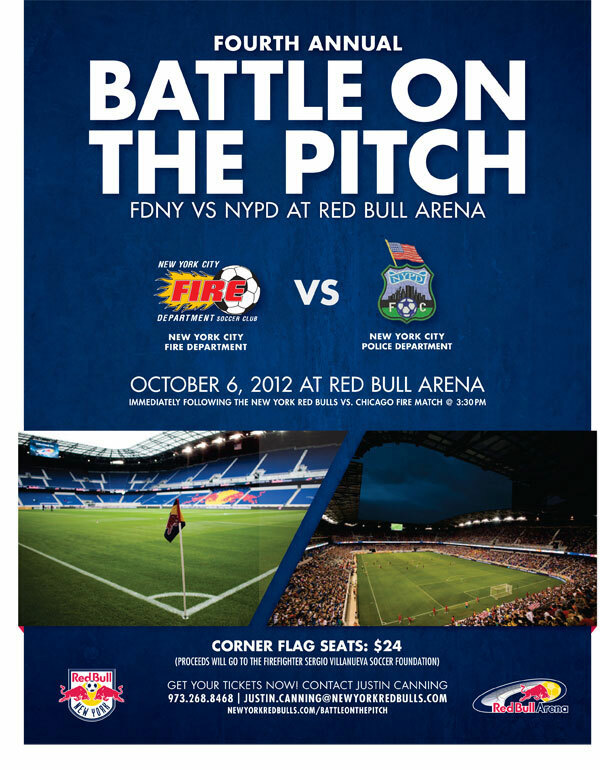 Both the FDNY and NYPD soccer teams will be recognized during pre-game ceremonies. 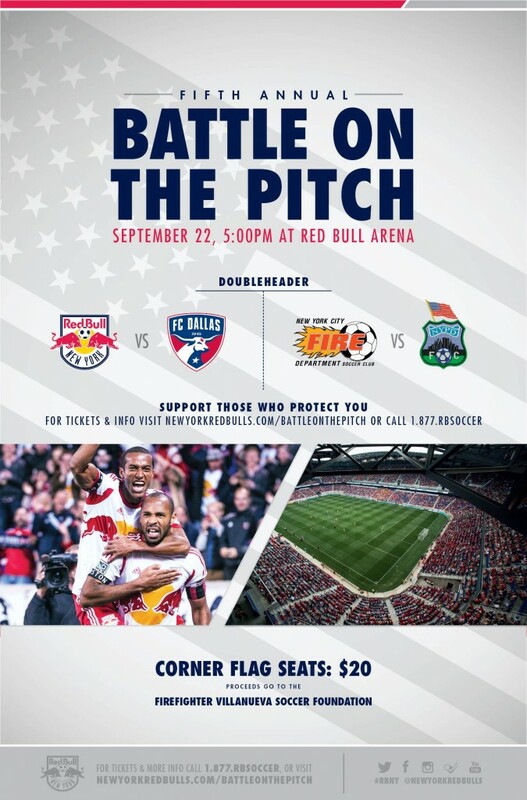 4th Annual Battle on the Pitch featuring the NYPD Soccer Club vs the FDNY Soccer Club will be held on Saturday Oct 6th following the NY Red Bulls vs Chicago Fire contest. The MLS game starts at 3:30 Tickets are $24 with proceeds benefitting the FF Sergio Villanueva Soccer Foundation. New York firefighters who survived the September 11 terror attacks are preparing to take on their Manchester counterparts for a charity football match. 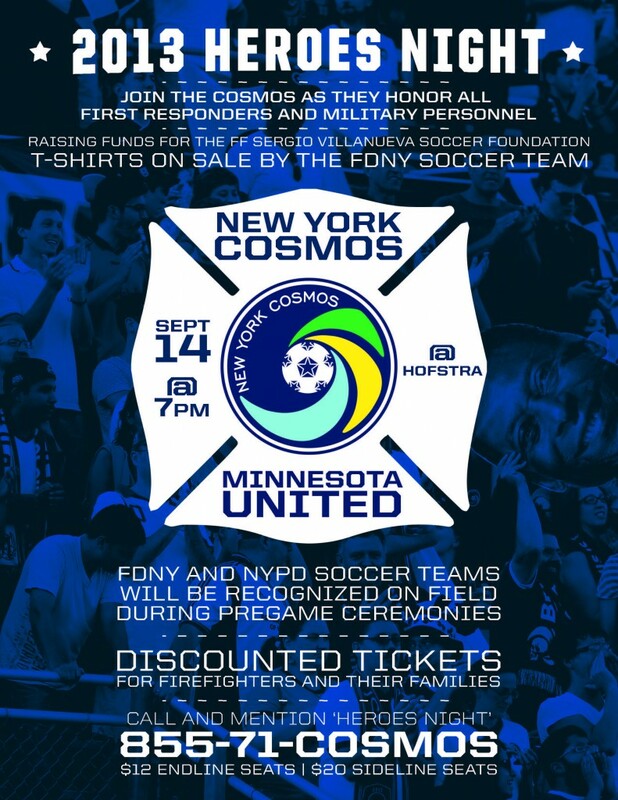 The FDNY Soccer Club will play the Manchester FD in a bid to raise 25,000 to benefit the Sergio Villanueva Soccer Foundation and the Greater Manchester Fire and Rescue Benevolent Fund. The match takes place on August 19 at Salford City Stadium and was organised by Mike O’Neill, 47, crew manager at Eccles fire station. Explaining how the match came about, he said: I was on holiday in New York for the St Patrick’s Day parade and I met up with some of their firemen and it went from there. I invited them over here for a football match and they said they’d love to. The four-day trip will also double as a working holiday for the New York firefighters, who will pass on tips to their Manchester counterparts. Mike said: They’re doing half-an-hour before the game on their experiences of 9/11, how to tackle fire in high-rise buildings. It will be interesting to hear from them from a professional point of view. Although the match kicks off at 4 p.m., live bands, stalls and displays will form part of a fund day which starts from 1 p.m. Mike added: It will be a great day and it’s for a good cause. As we near the end of the football season, our friend in Exeter will be going down to league 2 as a sub-par season ends. Our friends in Liverpool look to salvage a down year with a win vs Chelsea in the FA Cup final. The foundation is planning a trip to England in August. We will let you know our schedule as soon as it becomes available. Sergio’s Alma Mater – Holy Cross High School will be holding their 30th Annual Golf and Tennis Classic at Engineers Country Club on Monday June 25th. They will be honoring Sergio and 15 other Holy Cross graduates who lost their lives on Sept. 11th. Breakfast, BBQ Lunch, Cocktail Hour, Dinner, and Live Auction are included in the cost. The Firefighter Sergio Villanueva Soccer Foundation hopes you and your loved ones had a happy and healthy New Year. The holidays are always a tough time for those who have lost loved ones, but faith sometimes allow you to rejoice in the blessings that surround you. The EPL is heating up as Man City has come back to reality, while Man U and Spurs challenge for the top spot. Our friends at Exeter (League One) have played well after a slow start and look to improve their position a few spots above the relegation zone. 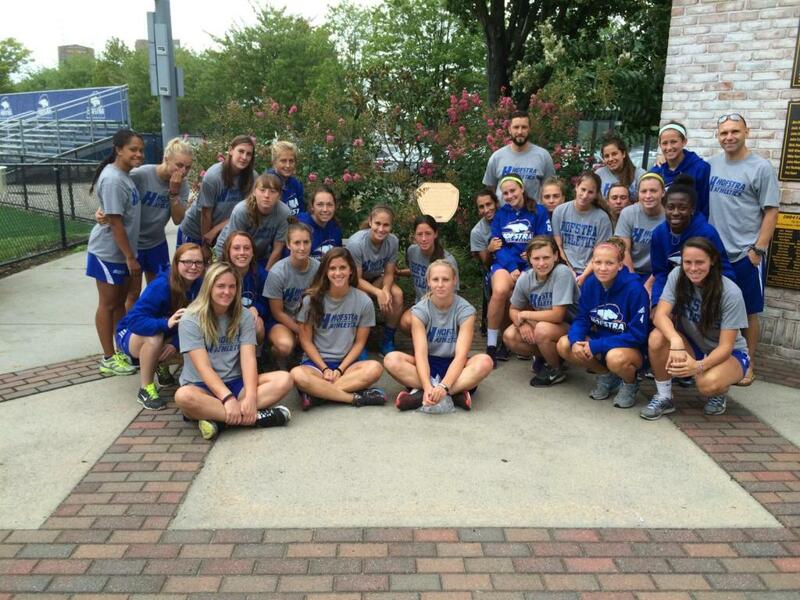 Hofstra University Men’s and Women’s team represented the foundation well during the season and look to improve upon their finish next year. Holy Cross Boys Soccer continues to play hard while advancing to the CHSAA quarterfinals.